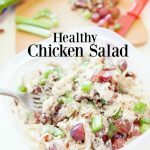 A healthy chicken salad recipe is a great way to make a lunch for yourself one day, and spread it out throughout the whole week. 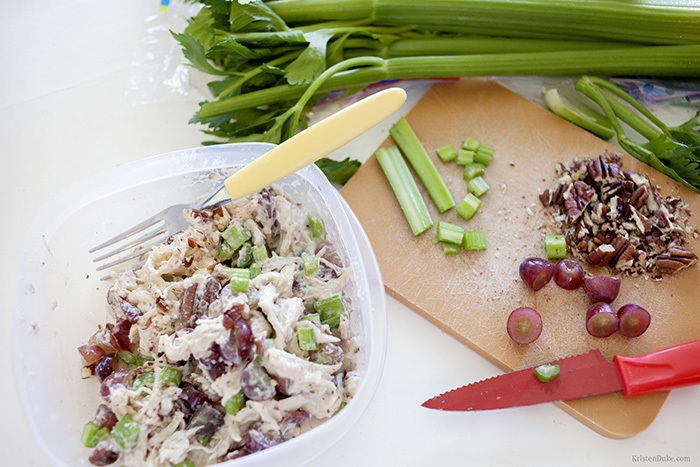 With flavorful chicken, grapes, celery, and nuts, you are sure to enjoy this, or share it at your next girlfriend lunch! 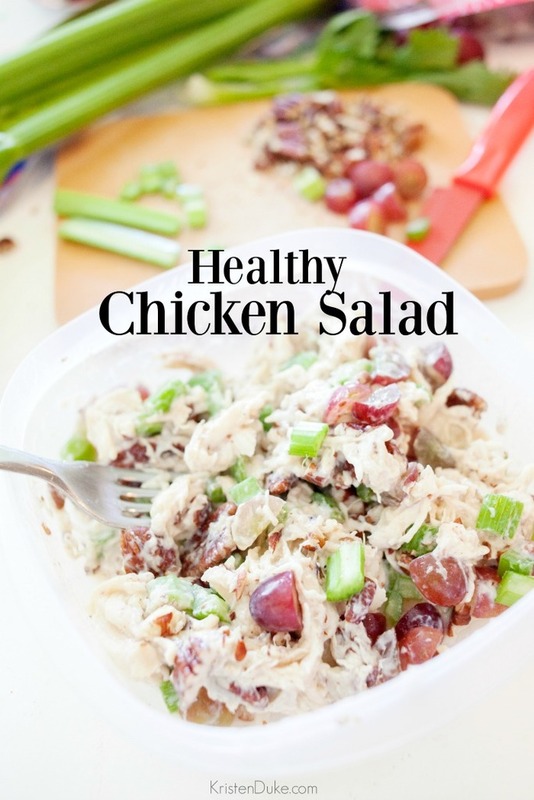 Healthy chicken salad recipes seem to be hard to come by. It used to be when we hear the word “salad” that it’s healthy, but over time I’ve realized…THAT’S NOT THE CASE! Even with most chicken salads, they have a mayo base, and though it’s not french fries (love those guys, too!) I like to lighten things up when I can. So this chicken salad recipe has a plain yogurt base, and the flavor comes from other places. Flavor: a rotisserie chicken! What?? Ok, you all may have known this secret, but where the heck have I been??? I’ve hard the love for this already made chicken for years now, but I ignored it because I didn’t want to mess with the slimy chicken. It reminded me too much of the Thanksgiving turkey which I try to avoid at all costs. But you know what? I gave it a chance and I’m heard to say, IT’S NOT THAT BIG OF A DEAL!!! Especially if you wait til it’s cooled down, then it’s less slimy. Chop, stir, mix, and voila! You can serve up the healthy chicken salad recipe in lettuce wraps, tortilla’s, or crackers, but I like it straight out of the bowl. If this isn’t enough to convince you, you may enjoy the video I made about it. My eyes are cropped out in part of it (my bad!) but I think it’s kinda fun otherwise. Chop, mix, and eat! Enough for several days, double for more. 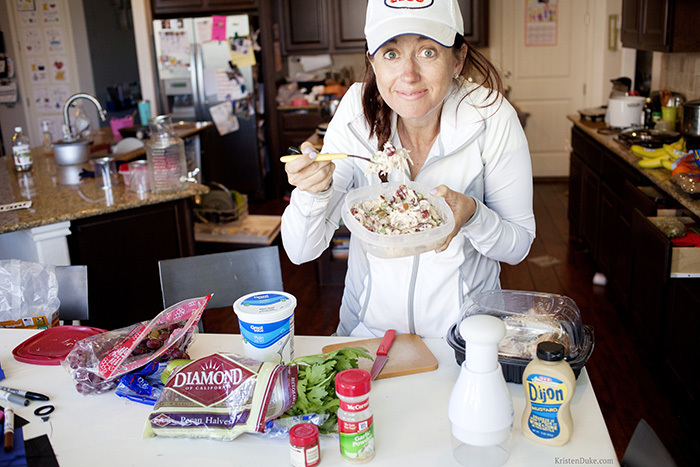 I’d love to hear, do you have a favorite ingredient in chicken salad? I also love hard boiled eggs, pickles, or pineapples, but this version is quick and easy, my favorite! For more healthy eating recipes, click that link to see more on my site!